Lose yourself in the beauty and tranquility of Silvermist Mountain Lodge and Organic Wine Farm – a privately owned estate in excess of 50 acres tucked away on the spectacular slopes of the Table Mountain National Park – spacious suites, cozy cottages and large lodges all with breathtaking views surrounded by fresh mountain air. 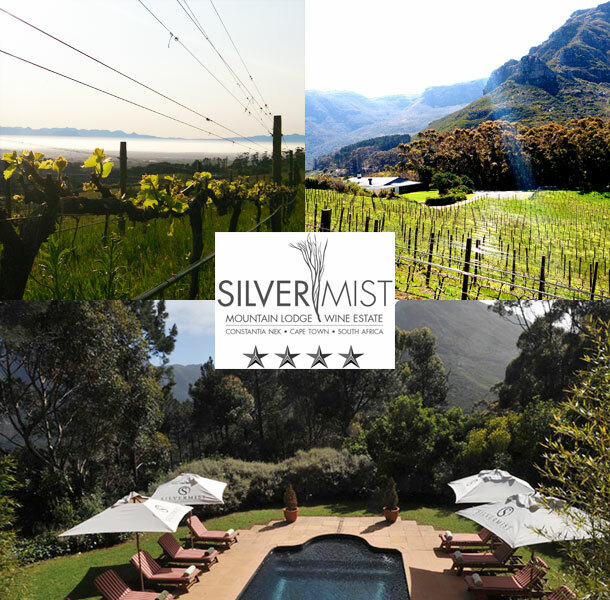 Silvermist Mountain Lodge & Wine Estate lies within the famed Table Mountain National Park, with breathtaking views of the surrounding Constantia Vineyards, providing endless photographic opportunities. With three distinct venues to choose from, each offering its own unique style and atmosphere, Silvermist is perfect for every sort of celebration. Our biggest venue – seating up to 140 guests, is surrounded by spacious lawns for your wedding ceremony. Inside we are equipped with air conditioning for those hot summers evenings as well as a magnificent fireplace to keep you warm on those chilly winters’ nights. Seats up to 60 guests inside with a wooden wrap around verandah that can be used for extra seating. With a relaxed and natural feel, the Tree House is well suited for an intimate and rustic celebration. To compliment this magical occasion a honeymoon suite is offered to the bridal couple. Silvermist Mountain Lodge has accommodation in Constantia for your wedding guests. To book your wedding at this gorgeous venue visit Silvermist Mountain Lodge.